Playing maplestory is becoming more like a responsibility than a game. It feels like being trapped in a loop. 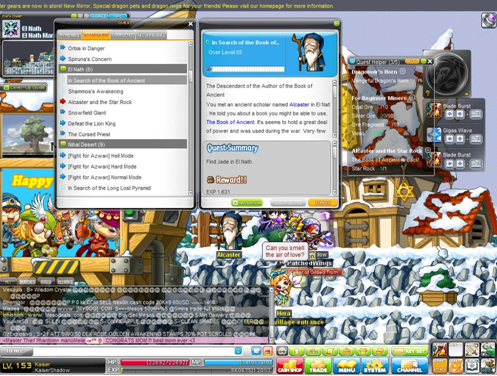 First thing in the morning: completing the daily quest and afterwards farm more maplestory mesos or stand all day in the market, selling some stuff. It is kind of suffocating to be trapped in this loop. There is a thread in reddit that pertains in this discussion. Someone asked, in reddit that what do other people do after finishing the daily quests and they all answer crazy stuff. This is pointless. Why bother taking the daily quests if the focus is other games? Probably, you are waiting for something to happen or you just feel a sense of responsibility on your account? Is it because you have invested so much time farming maplestory mesos that you can’t leave maplestory? Myabe players who are playing another game after completing their daily quests are waiting for the new update, waiting for maplestory to become interesting again just as it was first released. This is the most natural answer – Progress in the game, like challenging the end game content, complete monster book and more. This way completing the daily quests have purpose – to reach something, to reach the end game, now doing that daily quests have a purpose. But doing the daily quests and play another game afterwards is just pointless. Focus on one or two games. Don’t ever take reddit seriously because people in this website are not even serious, although there are threads out there that are somewhat serious.